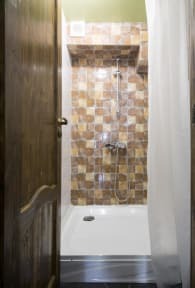 Hostel Author i Moskva, Rusland: Reservér nu! Hostel Author (Avtor) just opened in May 2018. This is a new comfortable place with a private entrance and cosy inner yard. Perfect location is characterised by its closeness to the metro stations (Taganskaya and Marksistskaya) and the center of Moscow. This historical building used to be an architectural workshop and the street is named after a great Russian writer Alexander Solzhenitsyn. 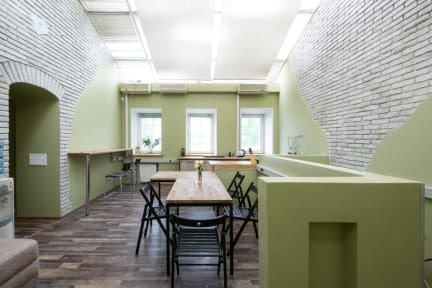 Hostel Author is located in Moscow city center and very close to two metro stations (only 200-300 meters away). It is absolutely easy to find us: you just need to get off the underground at Taganskaya or Marksistskaya station, cross the road and walk down Alexander Solzhenitsyn street as far as building 10 and turn right into the inner yard. You will immediately see our separate entrance with a big sign Avtor. There are 6 bedrooms. 2 shared rooms for 10 people both women and men with bunk beds. 1 room for females only (8 people). 2 rooms for 3 people each with single beds and one double room. 3 shared bathrooms and 4 shared toilets. Kitchen area with lounge zone. Linen, towels, tea/coffee and Wi-Fi are free of charge. We do not accept customers younger than 5 years of age. Reception times: 08:00 until midnight. At night possible upon prior request.